This is a special post done in collaboration with me and Vadim Sherbakov who is an independent interactive web and mobile application art director and photographer based in Moscow, Russia. To view Vadim’s work, visit his Instagram feed and Vimeo page. Are you looking to take your drone videos to the next level? Then the drone video tips below were created just for you! After you implement these drone video tips into your workflow, you’ll capture better looking, higher quality, more engaging, cinematic drone videos. 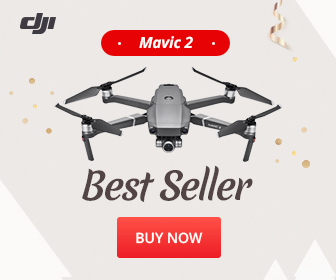 While a DJI Phantom 3 and DJI Phantom 4 were used to compile the information, the tips included below can be applied to all types of drones models from other manufacturers. Keep in mind that the tips are divided into 2 sections, Production and Post-Production. Let’s first start with some production tips. DJI drones use 12mb Sony sensors in both the Phantom 3 and Phantom 4 cameras which is why I always recommend using the lowest ISO possible, preferably 100 to avoid getting grainy footage. The higher the ISO the grainy/noiser the image is going to be. That is also why you should use D-Log under Picture Settings opposed to the default “.mov” or “.mp4” video codec setting. D-log captures a flatter, less contrasty image (see image below) which at first won’t look as good as the other options when you play it back because saturation, contrast and sharpness have been dialed back in the profile setting. However, D-log gives you the best possible image for capturing more dynamic range, which means it keeps more details in the highlights and shadows, which ends up giving you more freedom in post when you go to color correct and color grading your footage. This is why it is best to select Standard as the Picture Style because you can then add in the exact amount of contrast, saturation and sharpness via your video editing/grading software. Set your camera to the Manual Setting mode and then try to incorporate the 180º rule which says you should shoot at double the frame rate whenever possible. For example, if you’re shooting at 24fps or 25fps (frames per second), set your shutter speed to 1/50 of a second. If you are shooting at 30fps, then set your shutter speed to 1/60 of a second. This will allow your image to appear more cinematic and have more realistic blur. After all, video is a series of static pictures played back to back, so the right amount of motion blur is what magically convinces our eyes of smooth, life-like movement. In order to achieve these slow shutter speeds though, you will likely need to use 3rd party camera filters. I use Polar Pro filters. These filters allow you to get less light into the camera sensor and keep the shutter at the desired frame rate. Essential what is happening is you are putting sunglasses over the camera lens to let in less light, which will prevent your image from being blown out due to the slow shutter. It’s best to overshoot opposed to wishing you had shot more. I always use the following rule whenever I think I’ve captured enough video footage: shoot for an extra 5-10 seconds before stopping record. When you get into the post-production stage and start editing your footage you’ll likely be thankful for the extra footage you got because it could allow you to add a longer cross fade to the next clip for example. When it’s possible and safe, try flying backwards, not just forward. This can be a helpful to do in high wind because flying backwards and pushing away from your subjects can eliminate the possibility of getting the propellers in the frame. Once you perform this maneuver, bring your footage into your editing application and reverse it. This will then create a pushing forward movement because it is now playing backwards. Of course this won’t work in every scenario like when there are people walking around or cars driving because everything will look backwards and weird. This will give you various options in post. So try flying sideways, from top to down or vice-versa. It will pay off in terms of getting some great unusual footage and cinematic angles because you’ll notice different things when you are sitting down at your computer, focused on your footage. Even a small water drop can pop in front of lens can ruin the whole shot. So think twice when flying even with a light drizzle, unless that is an effect you are after. (Check out my article title 7 must-have apps for drone pilots for help on this one). A good rule of thumb is to capture a scene three different ways so you have options in post. One of the most important things in editing is footage selection! Be critical of your footage by ditching all the shots that don’t further the feeling or story you are trying to convey. For example sudden shaky movements, props in frame, imagery that is washed out, too dark or too bright, etc should be avoided. Use only the best ones. Less is more. I always search for a great soundtrack before I start cutting and editing my videos. Music should be the canvas to your footage and set the overall tone of your film. There are some great free music resources like the YouTube Audio Library but like all things in life you get what you pay for. That is why I like to use a paid service called The Music Bed. They feature a huge selection of music at a fair price. When it comes to editing, I use the Adobe Premiere Pro editing suite because it allows instant integration with other Adobe applications like Adobe After Effects and Adobe Audition. If you need some help picking video editing software then check out my article: 5 Useful Tools for Drone Videography Post-Processing. I shoot in 4K but my films are either 1080p or 3K max. The reason why I do this is because it gives me more freedom to move footage around, scale it down, or even recompose a shot. For example, if you’re shooting in 4K, and then exporting to 1080p, and you accidently have your props peaking in the top of the frame you can then move the video clips position up until you can no longer see the props. Another thing to be aware of is the fact that a lot of people edit their drone videos by having very loooooong scenes. These editors leave viewers on one scene for way too long, which, in my opinion, makes it rather boring to watch till the end. I recommend a balanced approach where you aren’t afraid of cutting scenes shorter so that you can keep momentum and interest in the video. My motto is I would rather have my audience want to watch my video again, instead of wondering when my video is going to be over. If you’ve flown forward in one scene, try a sideways motion or a top-down view in the next, so the whole dynamic does not look monotonous and one-directional. Use your best judgment. That is after all, what makes a film unique and truly your own. Try to be critical about what you and your viewers will see in each scene. Cars, people, unnecessary objects or drone operators will cheapen the whole production, unless it’s intended and relevant to the film theme. A twisted horizontal skyline is also a sign of an amateur. So spend a few minutes correcting crooked horizon lines. Remove objects/people from footage. This can be achieved in many way using masks, cloning and tracking. The default After Effects Optics Compensation plugin can help fix the camera’s distorted edges and uneven horizon. Sometimes I use the ReelSmart Motion Blur plugin for fixing or adding in some “cinematic” motion blur. Also I use DEFlicker plugin on some of the video clips which helps reduce and sometimes eliminate flickering. You can go even further and add some flares to the footage and be like the flare king, J.J. Abrams :) Optical Flares is the best plugin for that. Right after editing is done I will color correct my video footage and bring it all to the “same level”. The goal with this step is to have all the footage evenly adjusted and matched to one another. Therefore, your footage shouldn’t be dark or too washed out and footage shouldn’t have different color casts like overly blue or orange from scene to scene. The best way to do this is to select one clip to be “the main reference clip” that all the other footage will be matched and corrected to. I use Premier Pro’s Lumetri Color plugin for that. After that stage is finished I will do color grading, using the ever so awesome Magic Bullet Looks plugin from Red Giant. Typically I start with one of the many presets & then build a custom look upon that, tweaking it to my liking. Once I am happy with the way most of the scenes look, I may choose to use some custom precision color correction on some of the scenes. Luminosity Color or Curves or Hue/Saturation are great effects for that. My rule is to always do color correction first and then color grade your footage last. Probably the biggest rookie mistake is to leave all your clips in their default stage like they all just came straight from the drone’s camera. One way to go the extra mile is to add some sound effects (Sfx) to your video in post. Sfx give your films another “dimension” of presence, helping it to come alive and take it to the next level. I use various free and paid sound effects from different online libraries, one of my favorites is Audio Jungle, but check out the list below or do some searches online to find a site you like. While I encourage you to be creative you must show some constraint and be careful not to over overdo the sounds effects. Also be sure to use relevant effects and well-considered sfx for specific moments and subjects. Just adding them in blindly can have the opposite effect and become distracting. So spend time selecting your SFX and balancing them with the music bed so they work together. I use both Adobe Premiere Pro CC and then Adobe Audition for the times when I need to really fine tune the audio mix. Go an extra mile and create a well designed cover for your film, so the project thumbnail feels complete and professional (like in the example above). Don’t underestimate the power of doing this step because this is the main way people decided whether or not to click play on your film or to just keep scrolling by. So take the time to make it look great. No matter what project you are working on, try to imagine yourself doing it for a big Hollywood release. This means you will pay close attention to every small detail and spend more time capturing epic footage and being picky with the post-production process. All in all have fun and make something worth watching! …Did I miss something or forget to share one of your favorite aerial video tips? If so I would love to hear your thoughts down in the comments below or please share what tip was most helpful to you or what topic you would like me to go more in depth on in a future article or tutorial! This is super helpful. Thank you so much for sharing. Love your blog and IG. So happy to hear that! Thanks for the comment Kati! So helpful Dirk! Awesome post, thank you! Huge thanks for the support Matt! Thank you for providing us with such great information. What editing app are you using? If you are using Premiere, or Final Cut you can easily do it with those. You will just need to create a solid and fill it with a color, then lower the opacity to about 30% or so. You might also look at using After Effects which will give you a lot of control. You could even create it in Photoshop and then just import in the artwork. This forumn was a great read and gave me some inspiration for my own edits. Love the cover art look and hope to create a nice twist on your idea. Although, I have been experimenting with different export settings and struggle to determine what is optimal. Editing in Premier Pro and shooting in 4k (Typhoon H & Hero 4), I’d like to share my productions in Instagram, as well as Facebook and YouTube. Are there any base settings or guidelines that I can apply, so that minimal changes can be made for the different scale requirements for each social platform? Hey Ryan, thanks for the comment! For YouTube just use Premiere’s YouTube preset. That then sets all the settings automatically for you. You can then use that same file for Facebook. For IG it is still kinda hit or miss for me but I seem to have the most success with using 24fps and the H.264 codec. Hope that helps! This tips is so much helpful. Thanks a lot for sharing. Stoked to hear that! Thanks for reading Pulau! Thanks for the sharing ! Really Helpful ! Anyway how , i have a question regarding to FPS to shoot video . I normally use DLog and 1080P 60fps as i love slow motion cinematic effect . My question is , is it necessary to shoot 60fps ? As i can see the stability of my phantom4 is quite good ! Hi Ceavs, thanks for the comment! No you definitely don’t have to stick to that but it generally looks better than say a shutter speed of 1/1250. Look into getting some ND filters if you need to play with shutter speeds since they act like sunglasses for your lens which lets in less light. Also the filters give you a little room to play but it is still recommended that you keep the multiple going. So for example (and easy math), if you are shooting at 30fps, but need to increase the shutter speed do so with increments of 30, so: 60, 90, 120, etc… or the closest shutter speed to those numbers are generally said to look better. Hope that helps! If i can only choose to buy ND and CPL/ND . Which one better? I have found out : PL/ND filter might give you a better look under reflection but it may give an inconsistent look on graded sky or water if we turn the angle of drone or shoot different fields in one flying trip. Great article! I have one quick question. I have the Polar Pro Vivid Collection which comes with a ND4/PL, ND8/PL, and ND16/PL. When I use them does the shutter speed still need to be double the frame rate or do the filters give me more room to change the shutter speed? I was confused on setting the camera settings while using the filters. Thank you! Hey Nicolas, thanks for the comment. The filters give you a little room to play but it is still recommended that you keep the multiple going. So for example (and easy math), if you are shooting at 30fps, but need to increase the shutter speed do so with increments of 30, so: 60, 90, 120, etc… or the closest shutter speed to those numbers are generally said to look better. Hope that helps! Thanks a lot Lionel! Really appreciate the support!! Great info. Re the covers for the videos- are you using PS ? Hi Tino, yes I am! Great article got the idea. Thanks for the info it helps a lot.